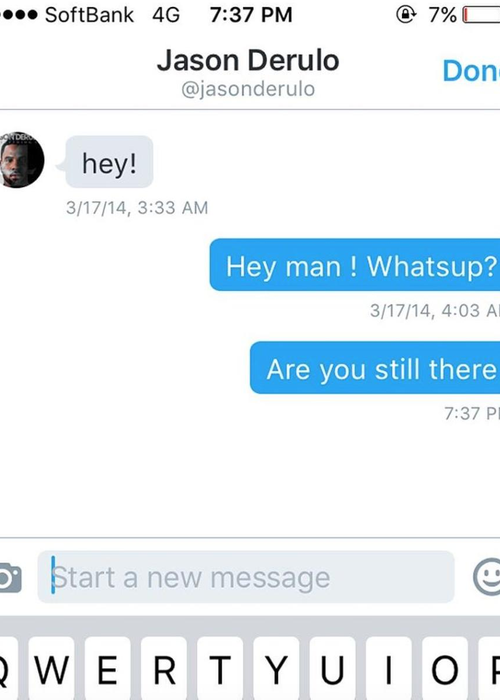 Jason Derulo's FINALLY Replied To 5SOS' Twitter DM After Two Years - Was It Worth The Wait? After TWO years of waiting, the 5 Seconds Of Summer boys have FINALLY had the reply they wanted all along from Jason Derulo! The ‘Don’t Stop’ four-piece posted a HILARIOUS Messenger exchange (or lack of) on Instagram between themselves and Jason Derulo back in February. The messages show Jason chiming up to say hello and the boys replying and then… nothing! They’ve since posted a funny follow-up asking if Mr. Derulo is “still there”, two years after his lack of a reply! And now the moment they've been waiting for has arrived - a reply from the man himself! Jason tweeted this week telling the boys to "check your DMs" but sadly we've no idea what he's been talking to 5SOS about. Care to fill us in, boys?